One month after Islamic militants bombed two Egyptian churches during Palm Sunday and killed nearly 50 people in April 2017. On Friday, May 26, several SUVs stopped two buses transporting dozens of Christians to visit and pray at the ancient Coptic Monastery of St. Samuel the Confessor, in the desert south of Cairo. According to initial reports, about ten Islamic militants, heavily armed and dressed in military fatigues, “demanded that the passengers recite the Muslim profession of faith”—which is tantamount to converting to Islam—and when they refused, the jihadis opened fire on them, killing 29 Christians, at least ten of which were young children (including two girls aged 2 and 4). Mohsen Morkous—an American citizen described as “a simple man” whom “everyone loved”—his two sons, and his two grandsons were among those killed. 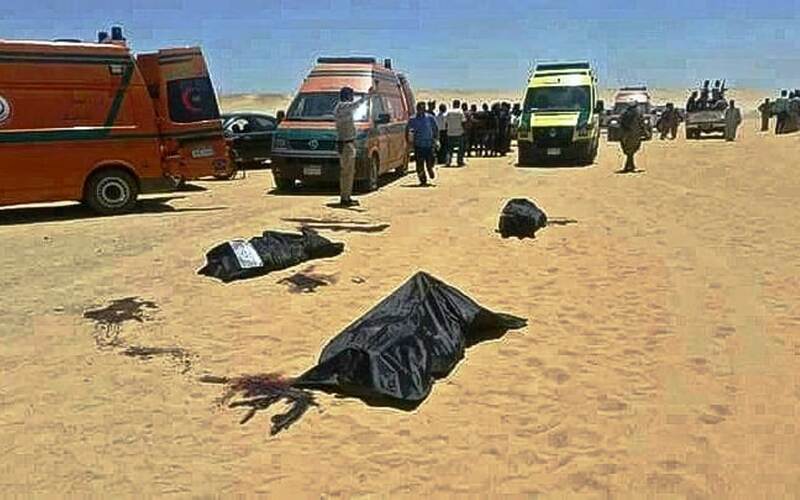 A video of the immediate aftermath “showed at least four or five bodies of adult men lying on the desert sand next to the bus; women and other men screamed and cried as they stood or squatted next to the bodies.” They were left in this condition for some time. According to a man who spoke to hospitalized relatives, “authorities took somewhere from two to three hours to arrive at the scene.” The man “questioned whether his uncle and others might have lived had the response been quicker. Mohamed Elibiary, a Muslim Brotherhood operative and former Obama administration official at the Department of Homeland Security responded to the ongoing slaughter of Egypt’s Christian minorities at the hands of Islamic radicals by tweeting, “what goes around, comes around.” His point was that, because the Copts had denounced the Muslim Brotherhood during Muhammad Morsi’s presidency, so now the sword of jihad is apparently “reciprocating” in like manner. Similarly, days before this latest attack on Mideast Christians, journalist Shannon Bream announced a forthcoming segment on the growth of Christian persecution around the world. In response, Matthew Dowd of ABC News tweeted “Maybe you can talk about the bigger problem which is persecution of Muslims in America and around the globe. Bigger issue.” In the real world, however, Christians are the most persecuted group: 90,000 died for their faith in 2016; and Islamic extremism is the primary source for this persecution. Mexico: On May 15, a knife-wielding Muslim attacked and tried to behead a Catholic priest while he officiated at the altar of the nation’s largest cathedral, the Metropolitan Church of Our Lady of the Assumption. The assailant, apparently named John Rene Rockschiil and possibly of French origin, managed to plunge the knife in the neck of Fr. Miguel Angel Machorro, 55, before being restrained by parishioners. Fr. Miguel died later of his wounds. Germany: A Muslim man and asylum-seeker with a kitchen knife stabbed and killed a Christian woman in front of her two children near a public marketplace. Those who knew the slain woman, an Afghan who converted to Christianity eight years earlier, said she was the epitome of assimilation and an “example of integration.” “A religious motivation is being examined” said officials—apostasy from Islam does earn death—“although we cannot confirm this yet,” police spokesman Stefan Sonntag explained. Philippines: In late May, a jihadi uprising consisting of both Philippine and non-Philippine Muslim militants, including ISIS-linked Indonesians and Malaysians, erupted in the Islamic City of Marawi. Among the initial carnage, a civilian bus was stopped by the Muslim militants and when the nine passengers were discovered to be Christian, they were tied together and shot dead, execution style. “I am pissed by those kinds of people,” said a local. “They kill defenseless people. Those who were killed were Christians.” The militants also torched a school and a church. One official called the violence an “invasion by foreign terrorists, who heeded the call of Isis to go to the Philippines if they find difficulty in going to Iraq and Syria.” It took more than three days for the military to quell the uprising; 15 members of the security forces and 31 militants were killed. Sudan: On Sunday morning, May 7, as Christians were preparing to worship in the Sudanese Church of Christ in Khartoum, authorities arrived with bulldozers and demolished the church. According to the report, the government claims the church of being “built on land zoned for residential or other uses, or were on government land, but church leaders said it is part of wider crack-down on Christianity,” especially evident in that the government has yet to shut down or demolish a single mosque on the same claim. After explaining that Sudan was in serious violation of constitutional and international conventions of human rights, lawyer Demas James added that the building was destroyed on a Sunday shows the government’s lack of respect for Christian holy places: “You can see there is no place for worship left now for the believers to worship.” The demolished church is one of 25 church buildings marked for demolition on the claim that the churches were illegally built. Austria: What was described as a “dark skinned immigrant” was videotaped by a bystander’s phone camera throwing things and striking at the large cross in front of the St. Marein parish with a long pole and causing 15,000 Euros’ worth of general damage to the property. Police eventually subdued the “apparently insane man” and took him “to a hospital.” There have been numerous instances of Muslim refugees attacking churches and other Christian symbols—most notably the cross but statues and icons as well—in every European nation that has taken in Muslim migrants. Pakistan: A Christian pastor who has been “tortured every day in prison” since July, 2012 when he was first incarcerated, was sentenced to life in prison in May. Zafar Bhatti, 51, was found guilty of sending “blasphemous” text messages from his mobile phone; but human rights activists contend that the charge “was fabricated to remove him from his role as a Pastor.” His wife, Nawab Bibi, says: “Many Muslim people hated how quickly his church was growing; they have taken this action to undermine his work… I wish our persecutors would see that Christians are not evil creatures. We are human beings created by God the same God that created them although they do not know this yet.” She adds, “There have been numerous attempts to kill my husband — he is bullied everyday and he is not safe from inmates and prison staff alike.” In 2014, he “narrowly escaped assassination after a rogue prison officer,” Muhammad Yousaf, went on a shooting spree “to kill all inmates accused of blasphemy against Islam.” Bhatti is one of countless Christian minorities to suffer under Pakistan’s blasphemy law, which has helped make that country the fourth worst nation in the world in which to be Christian. Asia Bibi, a Christian wife and mother has been on death row since 2010 on the accusation that she insulted Muhammad. Iraq: One of the Shia-majority nation’s leading Shia clerics, Sheikh Alaa Al-Mousawi, who heads the government body which maintains all of Iraq’s Shia holy sites, including mosques and schools, described Christians in a video as “infidels and polytheists” and stressed the need for “jihad” against them. Separately, when a Christian girl in in the Pakistani public school system sought “to study Ethics rather than Islamic Studies because of her Christian beliefs,” says a report, her Muslim teacher informed her that “if she refused to take a class in Islamic studies, she must leave…. The teacher also ordered her Muslim students to avoid eating with the Christian girl because of her faith.” According to the teenage Christian girl, Muqadas Sukhraj, her problems started in early April “when class teacher, Zahida Parveen unnecessarily began creating problems for me and expressing her displeasure with me because I chose Ethics. First, the teacher argued over the textbook of the Ethics class. Then she sent me out of the class as punishment. Later, she told me that if I could not study Islamic education, then why do I study in a Muslim school in the first place? She even told me, that, when she comes into the class, I must leave.” Much of this is in keeping with ongoing revelations, including by way of a 2016 report by Pakistan’s National Commission for Justice and Peace which found that the government continues to issue textbooks that promote religious hatred for non-Muslims. Separately, after a fist fight broke out when a Muslim teenager snatched a Christian teenager’s phone, a mob of armed Muslims responded by attacking Christians in Phul Nagar, District Kasur in Punjab Province. According to the report, “The armed men pitilessly bashed every person who came in their sight on the streets. What is more they stormed into the houses of Christians and sta[r]ted beating the Christians. They also resorted to aerial firing, therefore, causing terrors and harassment in the entire neighborhood. The attackers did not spare Christian women, and beat them also.” Christians informed local police, who did not arrest any of the culprits, although they are known to police by name and face.